Last night, Microsoft officially announced the reason why its Win10 version 1809 cumulative updates were having problems. Remember the Update Servers having hiccups? Yeah, that’s the bug. It only took ’em a week. There’s a reason why the patching team has a PR group. Just wish they’d do more, you know, PR. UPDATE: Interesting. Just looking at it, this notice only appears for Win10 version 1809 updates (presumably cumulative updates). But I’m about 99% sure the hiccups were being experienced with all Windows versions. Can anyone confirm? Bogdan Popa at Softpedia has the skinny. 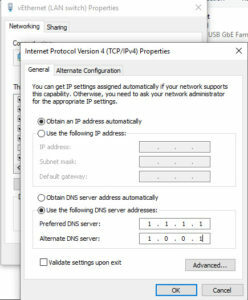 It looks like many DNS servers are mis-routing Windows Update connections. At this point, it looks like the problem ISN’T with Microsoft. Bogdan’s solution is to use the Google DNS server. A bit of irony in that, but hey, if it works…. I’ve been unable to connect to Windows Update for the last 12 hours via Comcast in US, but I can reach Windows Update after connecting via VPN. Step 3. Depending on which DNS server you trust, enter 1.1.1.1 and 1.0.0.1 to use Cloudflare’s DNS server. Or you can use 8.8.8.8 and 8.8.4.4 for Google’s, or 208.67.222.222 and 208.67.220.220 for OpenDNS’s. UPDATE: Looks like the problem was solved overnight.